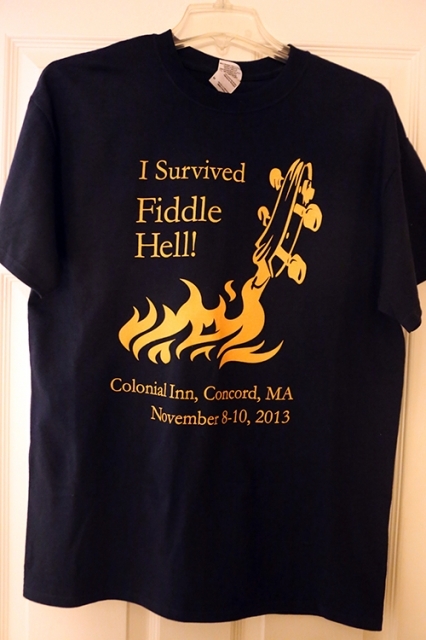 A weekend-long gathering of fiddlers of all levels, November 8-10 in Concord, Massachusetts. Thought some folks here might be interested in attending Fiddle Hell, an informal gathering of fiddlers who meet annually to jam, learn, and have fun. The gathering is held at the Colonial Inn in Concord, Massachusetts and starts at 12:00 noon on Friday, November 8th and goes until 6:00 pm on Sunday, November 10th. According to the website, there will be lots of different fiddle styles represented at Fiddle Hell, by fiddlers with a variety of experience, which makes it all the more interesting. I first heard about it here when Mr. Jim @Worldfiddler mentioned it in a post. I couldn't believe it when I read that it takes place only 45 minutes from where I live. Mr. Scratchy and I are planning on attending this year. Maybe we'll see some other fiddlerman.com members there. I will not be there but how SWEET is THAT > just down around the bend for ya!!!! SWEET!!! I would not miss it if it was that near. > Have a viddling time> IT will ROCK!! A FREAKING VIDDLE party >> How SWEET is that!!!!!!!!!!!!!!!!!!!!!!!!! yup, another member fiddlejammer goes there, or has. I first heard of it almost 3 years ago when I frequented another site for fiddling. I would def put it on my bucket list if I could afford a bucket. lol. It is a superb event. Something for everyone. Dave Reiner is a great guy, and so are his two (musician) sons, Andy and Eric. I'm happy to report that I survived Fiddle Hell 2013. In the words of @StoneDog , it ROCKED! I can't even tell you how much fun it was. I learned so much and it was a BLAST meeting and playing with a bunch of other fiddlers. There were sessions for all levels of fiddlers and many different styles. I participated mostly in beginner and advanced beginner sessions, which were on various styles including Old Time, Irish and New England. It was so cool to be in a room with 25-50 fiddlers all playing together. I was very glad that I had put in the effort to learn/memorize some of the tunes on the Fiddle Hell Common Tune list. I was able to play along and did fairly well keeping up since they were played at a moderate tempo. The instructors also taught tunes that were not on the common tune list, so we had to learn by ear, which was excellent practice for me since I'm not very good at that. The venue -- the Colonial Inn in Concord, Mass. -- is a quaint, distinctively New England inn that dates to colonial times. It was cozy and seemed appropriate for a fiddlers' gathering. The only downside was that some of the workshop rooms were too small and a bit cramped. I understand that the organizers are working to find additional space in neighboring buildings for next year. WOW!! > that must of been GREAT > some day I would like to make that gig. Did you get any pics? As a matter of fact, I'd like to do a video of an Irish tune that we learned -- The New Broom Barn Dance -- once I can play it decently. Oh Diane..what a great weekend. I am so glad you reported back to share. What a GREAT shirt. Wear it with honor! Did you buy a t-shirt as well or just took a picture? I bought the t-shirt and a Fiddle Hell mug. Mr. Scratchy got both, too. We also bought some CDs and music books authored by some of the workshop leaders.